Honeybells are Tangelos are Minneolas... OK, what does it all mean? It all means juicy, sweet, easy to peel, citrus that is the �Honey� of the �easy peeler� citrus industry! For the sake of �Cit-rical Correctness�, the proper name for them when you get right down to it would be, Minneolas . However, with their extraordinary, intense, sweet and juicy qualities, along with their �bell� like shape, it is easy to see how they got the descriptive nick-name �Honeybell�. These Honeybells are great as gifts for friends and family, or for yourself. They are handy to add in any lunch bag, they make great, healthful snacks anytime, and even kids love these little �gems� for their sweet flavor, ease of peeling, and not to mention how well they fit in little hands. But hurry, Honeybells are only around for a limited time every year! 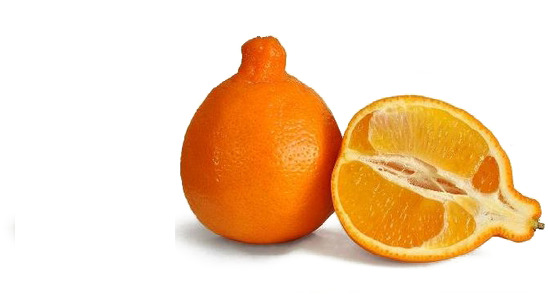 Honeybells are actually a cross between a Dancy tangerine and a Duncan grapefruit, which would make it...a Minneola. Honeybells have a rather short harvesting season. They are typically available from JANUARY thru APRIL. Due to their limited availability and short season, annual market pricing will also vary from season to season. How many pounds of Honeybells do I get in a box? Pearson Ranch sells it's Honeybells in 10 pound Quantities. If you would like 20 pounds or more, please call us for special pricing.